WHAT'S GOING ON CLASS OF 1977? This page allows you to post Class News or Announcements. For example: birthdays, anniversaries, births, promotions, graduations or other exciting stuff. Or perhaps you are involved with a fundraising project and you would like to share the information with others. And please brag about your children or grandchildren...we all want to hear about their accomplishments too. Unfortunately, with the good, comes the sad. If you know of an illness or death of a classmate or their family, you may want to share it with our class. We will also post these announcements. Please contact us through the website (www.jhrosehighclassof77.com) with your announcement or news and we will post it. Don't forget to include a picture if you have one so we can post it with your announcement. Most of you remember Billy and Sandra Stinson as teachers from Rose High School. Mr. Stinson recently retired from Rose High School with 34 years of service. I ran into Mr. Stinson recently and he mentioned he was throwing a "Stinson Cottage Benefit" on Saturday, April 28, 2012 from 7:30 - 9:30 p.m. at the Tipsy Teapot here in Greenville. 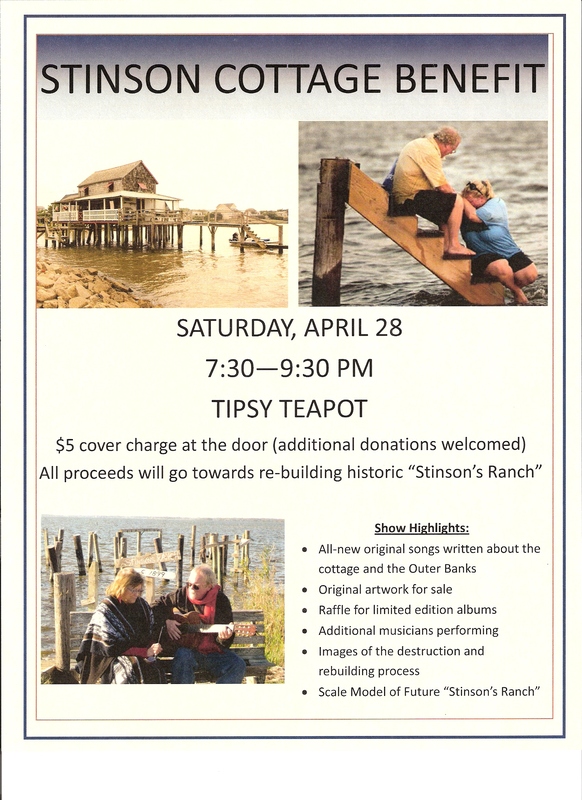 The $5.00 cover charge will go to help with the rebuilding of their historic "Stinson's Ranch" from the devastating damage from Hurricane Irene. I told Mr. Stinson that I would be glad to share this with our classmates. If you are local and would like to attend the flyer is attached. If you cannot attend and would like to make a donation, please feel free to mail a check payable to Billy Stinson and mail it to him at 1718 S. Elm Street, Greenville, NC 27858. Congratulations to one of our very own, Nita Raines Adams! She has just recorded her first CD, For His Glory My Offering. Nita wanted to share with her classmates the journey she has traveled through the years that began as a sophomore at J.H. Rose High School. Please check our her website at www.forhisgloryministries.net. You can also check her at on my space www.myspace.com/nitaadams. One of our own keeping the "green" in Greenville. 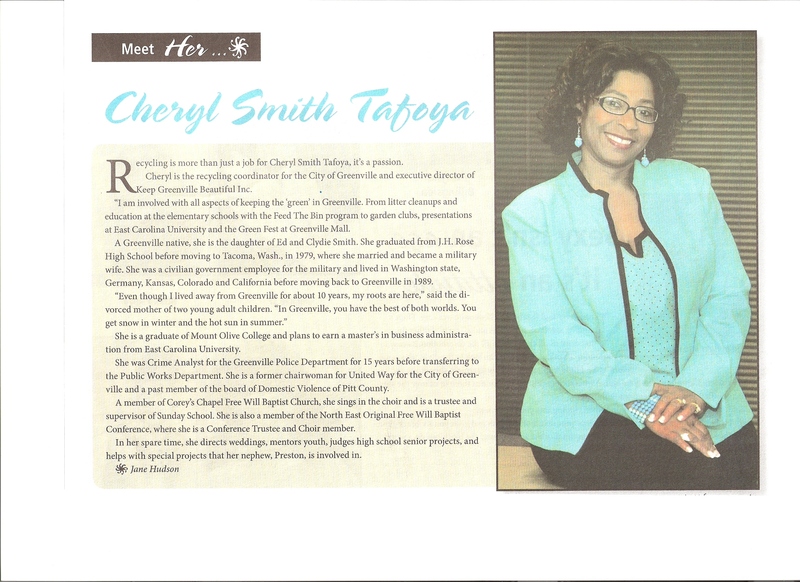 This article is the July 2009 edition of the Her Magazine which is circulated here in the Greenville area. To summarize the article since it is probably not legible, Cheryl is the recycling coordinator for the City of Greenville and executive director of Keep Greenville Beautiful, Inc. She is very passionate about her work and has been very successful in all the projects in keeping the "green" in Greenville. Several years after graduating from Rose High, her and her husband, who was in the military, llived in Washington state, Germany, Kansas, Colorado and California before returning to Greenville in 1989. She is a graduate of Mount Olive College and plans to continue her education at East Carolina University. Her proudest accomplishments are her children, Heather (graduate of UNC Chapel Hill who works for a pharmaecutical company at RTP) and her son, Mark (rising senior at NC State University who wants to pursue a law degree). Congratulations to Cheryl! We are all very proud of you!